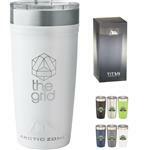 The OC Custom Travel Mug and Tumbler with a great grip design. 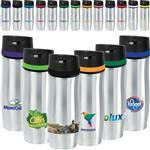 18 oz double wall 18/8 stainless steel thermal tumbler with copper vacuum insulation, threaded snap-fit lid. 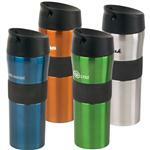 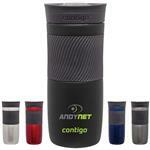 This is a quality vacuum insulated travel mug at a great price! 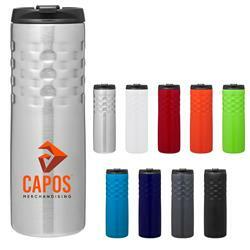 Typical Imprint Area(s): (H x W x Wrap): 3-1/2 x 2-3/4 x 8-1/4"
Persona Promotional Vacuum Travel Mugs with Color Accent Ring - 14 oz.